What do I need to separate proteins? • Sodium Dodecyl Sulfate (SDS) - a strong detergent with a hydrophobic tail and a negatively charged head. • Reducing agent - breaks covalent bonds between protein subunits. • Gel Loading Solution - includes glycerol to help protein samples enter into the wells and a visible dye to monitor sample migration through the gel. • Polyacrylamide gel - The separation matrix formed by polymerization of acrylamide monomers and chemical cross linkers. • Electrophoresis Buffer - contains ions necessary to conduct an electrical current, maintains pH. • Vertical electrophoresis apparatus - holds the buffer and the gel, has positive and negative electrodes. • Power supply - generates the current necessary to move proteins through gel. • Micropipet and tips - used to transfer samples into wells. • Protein InstaStain™ - used to visualize proteins. How does SDS-PAGE separate proteins? Proteins produce a unique challenge for electrophoresis because they have complex shapes and different charges, which affect how they migrate through the gel. In order to accurately separate proteins by molecular weight and not by shape or charge, the secondary structure of the protein is unfolded using the anionic detergent sodium dodecyl sulfate (SDS) and a reducing agent. The SDS molecules form a complex with the protein, negating its inherent charge. The reducing agent breaks covalent bonds that link protein subunits. After denaturation, the mixture of proteins is added into depressions (or “wells”) within a gel, and then an electrical current is passed through the gel. Because the SDS-protein complex has a strong negative charge, the current drives the proteins through the gel towards the positive electrode. At first glance, a polyacrylamide gel appears to be a solid. On the molecular level, the gel contains channels through which the proteins can pass. Small proteins move through these holes easily, but large proteins have a more difficult time squeezing through the tunnels. Because molecules of different sizes travel at different speeds, they separate into discrete “bands” within the gel. After the current is stopped, the bands are visualized using a stain that sticks to proteins. Want to perform SDS-PAGE in your classroom? 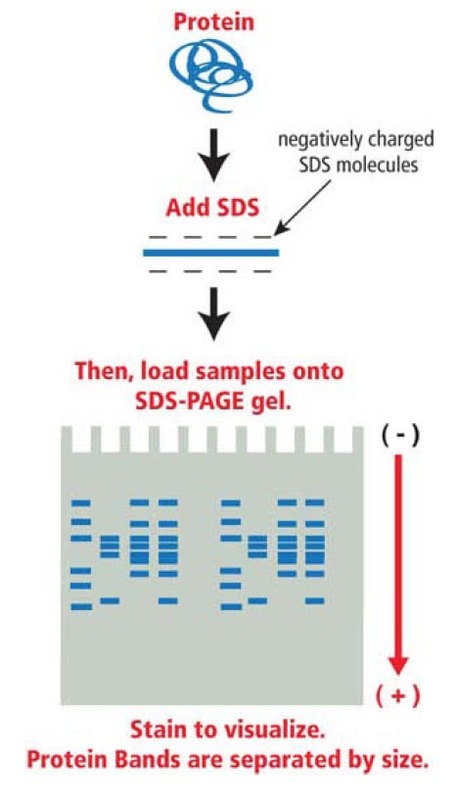 SDS-PAGE is a powerful technique that is used in research laboratories every day. However, that doesn’t mean that it is difficult to perform this technique in your classroom laboratory! For many years, Edvotek has worked with teachers to make these experiments simple and easy for students to perform. We offer a wide range of protein electrophoresis kits that are sure to fit into your curriculum. To complement our kits, we have recently redesigned out electrophoresis units to make them sleek, modern, and easy to use. 1. Large push tabs make lid removal simple. 2. The unique domed lid features a rubberized grip edge. This makes it easy to handle the lid, even when wearing gloves in the lab! 3. Our redesigned leads leave the lid at a 90° angle, conveniently tucking them out of the way. By changing the leads, we’ve lowered the profile of the MV10, minimizing the ability of the unit to tip. 4. Hate casting SDS-PAGE gels? The MV10 will work with several different sizes of precast polyacrylamide gels. 5. Worried about attaching the electrodes in the wrong orientation? Our unit is color-coded so that you can easily distinguish between the positive and negative terminals. 6. The improved support clip holds the gel securely in place when loading the gel. 7. As always, our electrophoresis units are proudly made in the USA! For more information about the MV10, including the User’s Manual, head to the product page at http://www.edvotek.com/581. 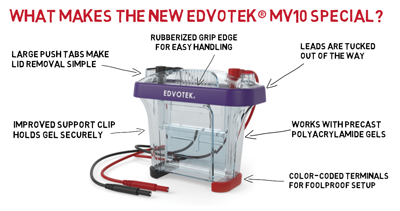 We think you’ll agree that the new and improved MV10 will simplify protein electrophoresis experiments in your classroom laboratory! For more inspiration, check out our FREE RESOURCES!